The DTES Street Market proudly announces the unveiling of ten (10) large (10ft x 6ft) works of art created by local artists from the Downtown Eastside (DTES) of Vancouver. 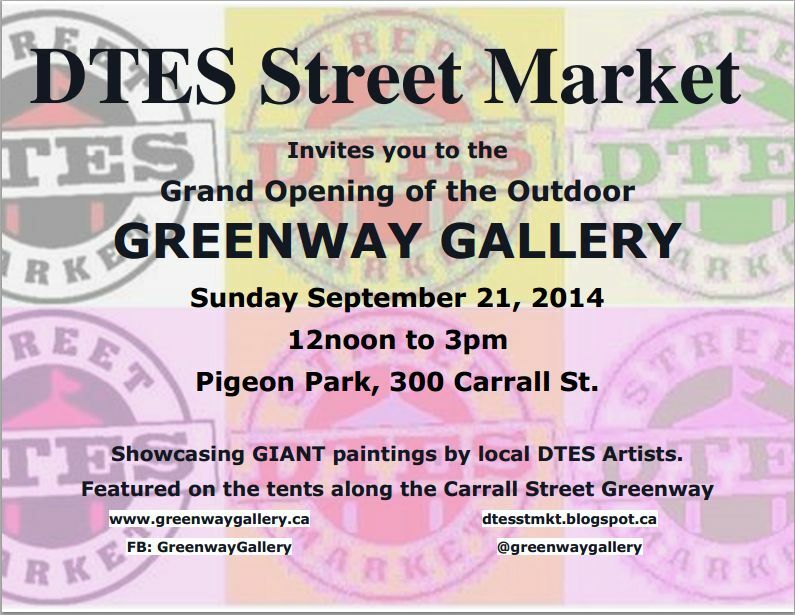 These works will be displayed along Carrall St. during market hours (noon to 3pm) on September 21st, 2014. 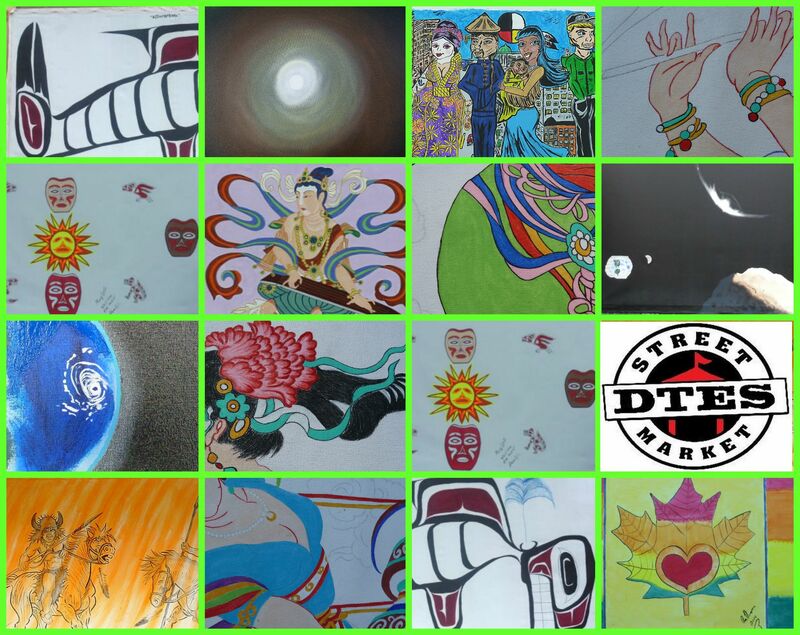 Each hand painted piece represents a different facet of the DTES culture, and the spirit of the commissioned artist. There will be five (5) pieces painted by Coast Salish and First Nations artists, representing stories from their ancestral home, and their proud cultural heritage. Two pieces on display will celebrate female empowerment and an unwavering celebration of our community. Two more pieces feature Chinese Tibetan Buddha scenes and traditional Chinese dancers. A final piece takes us to the stars with a cosmic ballet captured on canvas. 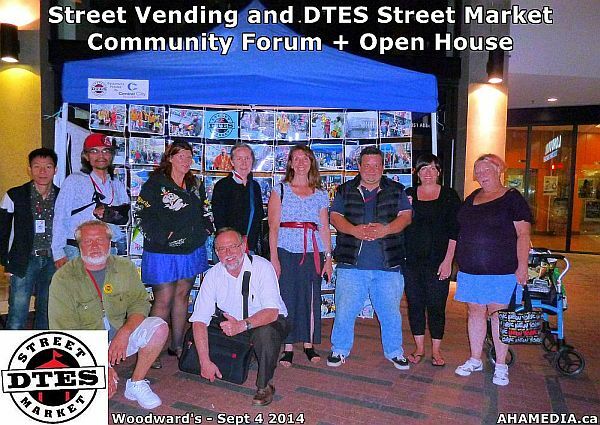 The DTES Street Market currently provides vending space for over 150 low income residents of the DTES every Sunday, and has been operating continuously since June 2010. We estimate that over $10,000 in commerce is transacted on an average Sunday, delivering over $500,000 into the hands of residents of one of the poorest postal codes in Canada. Over 20 tonnes of waste is removed from landfills every year by the efforts of hundreds of low income binners. The Greenway Gallery is an important project of the DTES Street Market in its efforts to activate, diversify and beautify the neighbourhood. These large works of art show the personality and talent that is waiting to be unleashed all over our neighbourhood, as well as allowing us to change and improve the types of items that are sold at the market and thus improve the perception of the market itself. The DTES Street Market strongly believes in listening and learning from all voices in our diverse community, for the betterment of all. Each 10ft x 6ft painting will presented for auction in the coming months to raise money for the DTES Street Market, help subsidize vending space for low income residents, and to facilitate our move from Pigeon Park to 58 West Hastings. The initial funding for this project, including art supplies and stipends for artists, and the activation of 62 East Hastings as a maker space for art work was supplied by the Great Beginnings program of the City of Vancouver.